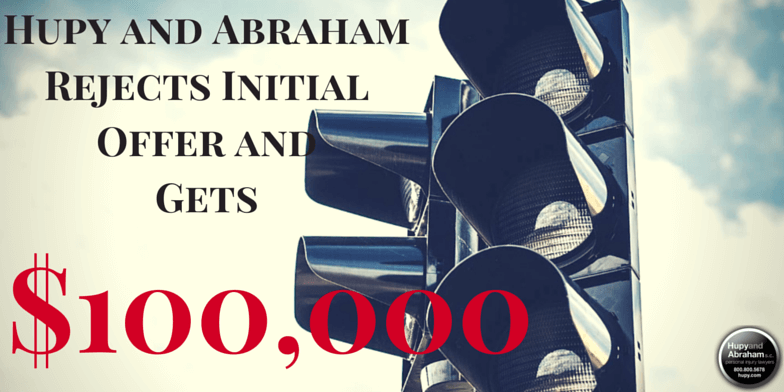 Hupy and Abraham Rejects Initial Offer and Gets $100,000 | Hupy and Abraham, S.C.
Hupy and Abraham's client was injured in a car accident in Roscoe, Illinois when the defendant driver ran a red light. Our client suffered a concussion as well as neck and knee injuries. The insurance company tried to low-ball our client, prompting Attorney James Theisen to file suit. Less than 30 days later, the insurance company caved and tendered the $100,000 policy limit.